Abstractions Floral is all about celebrating life’s special occasions, recognizing important achievements and performing generous acts through the elegant beauty of flowers. 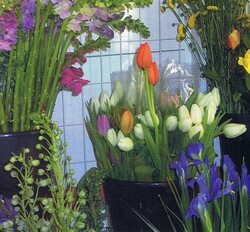 We are a boutique florist located in a home studio. Passionate about flowers and personal customer service, we enjoy creating custom one-of-a-kind arrangements for your event. In business since 1999, Abstractions is as much about relationships as it is about design. We have helped celebrate many local families’ occasions from new baby arrivals, to birthdays, first dances, weddings, anniversaries, and memorials. After more than five years in a retail locale, Abstractions decided to move to a home studio in 2008. This has allowed us to provide a better value for our clients and create a cozy and creative space to meet. Nature is what most inspires us. We love to use natural branches, vines, and grasses to accent our creations. We create original lush and grandeur masterpiece arrangements, dripping with seasonal wild berries, or minimal tropical pieces with exotic foliage. We take our time to listen to what our clients want. Owner and creative designer, Teri Hafvenstein, grew up surrounded by flowers working alongside her parents in their Portland, Oregon, nursery and flower shop. She studied floral and interior design in college and has perfected her craft with more than twenty-five years of experience.